So have you ever seen the commercials saying beta-carotene is high in “anti-oxidants” and inhibits “free radicals”. Have you ever wondered what those terms mean? If you’re like me, you think, “Anti-oxidant, good; free radicals, bad”, and never give it another moment’s thought. Prior to Ryan’s diagnosis and the subsequent care required, I had no idea what anti-oxidants and free radicals were, much less what effects they have on health. In a nutshell, antioxidants protect your cells against the effects of free radicals, which are molecules produced when your body processes food, or is exposed to environmental toxins, such as heavy metals (e.g., mercury, cadmium, lead…), cigarette smoke, pollution, pesticides, radiation—pick your poison. Free radicals can start a chain reaction that can lead to cell damage or cell death, and play a role in heart disease, cancer, diabetes, macular degeneration and other diseases, all of which are caused by oxidative damage—not to mention it's implicated in the aging process. Ryan, like many autistic children, experiences oxidative stress, and is not able to properly detoxify his body. Maybe you’re wondering where this fits in with today’s topic of methylation—a really hard subject that I’m sure requires a degree in biochemistry to fully appreciate. Oxidative stress impairs methylation. In the simplest of terms, the methylation cycle is a critical metabolic pathway for detoxification and anti-oxidation. It controls gene expression—turning genes on or off, or turning the “up” or “down”; it protects and stabilizes our genes to prevent abnormal DNA division and protect against disease. 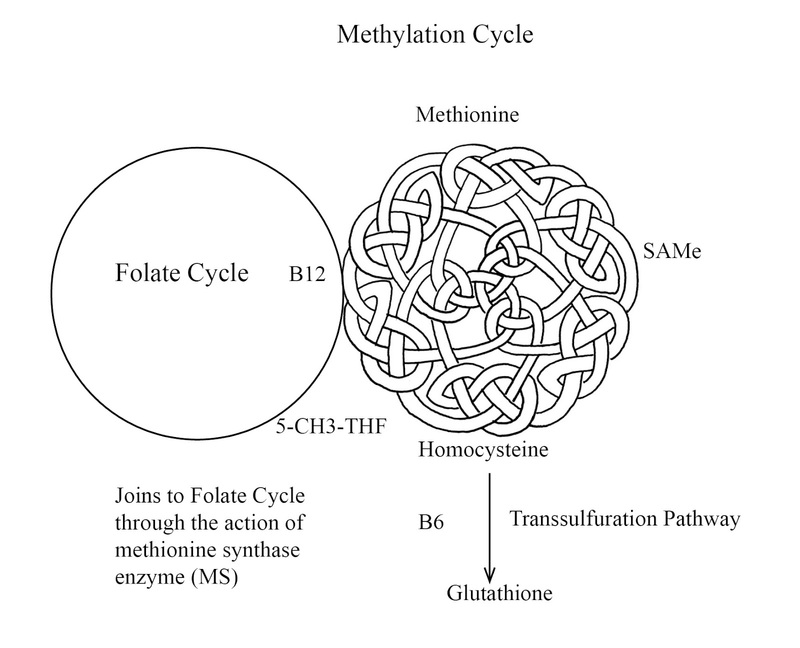 Methylation is fueled by B12 and folate, and through methylation the mother of all antioxidants, glutathione, is produced. Numerous studies have shown these pathways appear to be disrupted in autism. So what does this mean for Ryan? He can’t properly detoxify his body. For example, his body stores high levels of mercury, cadmium and lead because he is unable to cleanse these heavy metals. It doesn’t take a Biochemist to know this isn’t a good thing. Glutathione is the body’s primary detoxification mechanism, and he doesn’t make enough of it. 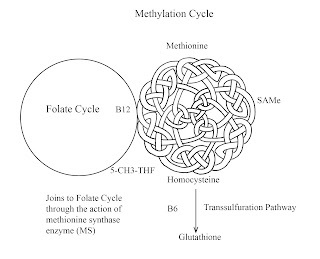 So what we try to do with Ryan is up his glutathione production by intervening in the methylation cycle, which is fueled by vitamin B12 and folate. He gets B12 injections twice a week, a transdermal glutathione cream that rivals La Prairie wrinkle cream in cost per ounce, along with a cocktail of other vitamins, minerals and other goodies important in methylation, such as CoQ10, creatine, carnitine, TMG, etc…the list is a long one. I am writing this piece for the folks who feel just a bit sorry for me that I am gullible for trying the equivalent of snake oil on Ryan, and that I am putting him through quite a lot for no good reason. You know who you are…and some of you have M.D. behind your name. I hope they will understand there is science behind it—even if I have greatly oversimplified it. Autism is complex and affects many systems in the body. We treat Ryan with a three-pronged approach. Ryan receives many hours of ABA therapy every week to teach him language, communication and social skills, and he gets medical care to treat his allergies and gut issues. We use biomedical treatments to treat those metabolic pathways that aren’t functioning properly. I am grateful to the researchers who have focused on autism etiology and mitigation. I hope one day their findings are taught in medical schools. Many of the things that are “wrong” in children with autism are never tested by common, mainstream medical tests. It stands to reason if you don’t know where to look, you won’t find anything and currently too many medical professionals don’t know where to look. The methylation cycle in autistic kids is a good place to start. Are there ways to measure improvement in Ryan's metabolism, which could be linked to the methylation treatments?